As ecstatic relatives watched and waved from behind a glass barrier, the 12 boys and their coach rescued from deep within a flooded cave in Thailand made the V-for-Victory sign from their beds in a hospital isolation ward where they are recovering from the 18-day ordeal. 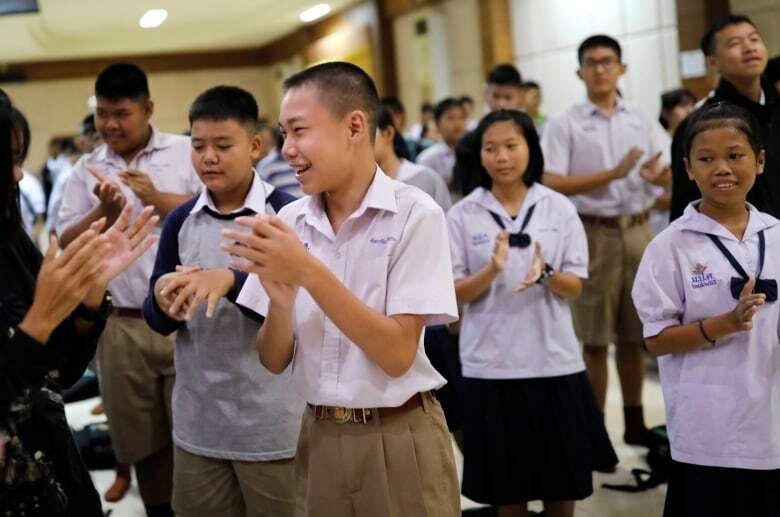 As ecstatic relatives watched and waved from behind a glass barrier, the 12 boys and their coach rescued from deep within a flooded cave in Thailand made the V-for-Victory sign Wednesday from their beds in a hospital isolation ward where they are recovering from the 18-day ordeal. An American involved in the operation described the perilous zero-visibility dives that brought the boys out safely as a "once in a lifetime rescue." Derek Anderson, a 32-year-old rescue specialist with the U.S. Air Force based in Okinawa, Japan, said that at times during the risky rescue, the boys had to be put into harnesses and high-lined across the rocky caverns. At other times, they endured dives lasting up to half an hour in the pitch-black waters. "The world just needs to know that what was accomplished was a once in a lifetime rescue," Anderson told The Associated Press in an interview on Wednesday. "We were extremely fortunate that the outcome was the way it was. It's important to realize how complex and how many pieces of this puzzle had to come together." He said the boys, ranging in age from 11 to 16, were "incredibly resilient." "What was really important was the coach and the boys all came together and discussed staying strong, having the will to live, having the will to survive," Anderson said. That gutsy determination was on display Wednesday in a video taken from the hospital isolation ward. The boys, their faces covered by green surgical masks, sat up in bed and chatted with their nurses, at times responding with the customary Thai sign of respect — hands pressed together while bowing the head. The youngest boy, 11, appeared to be asleep under a crisp white sheet. 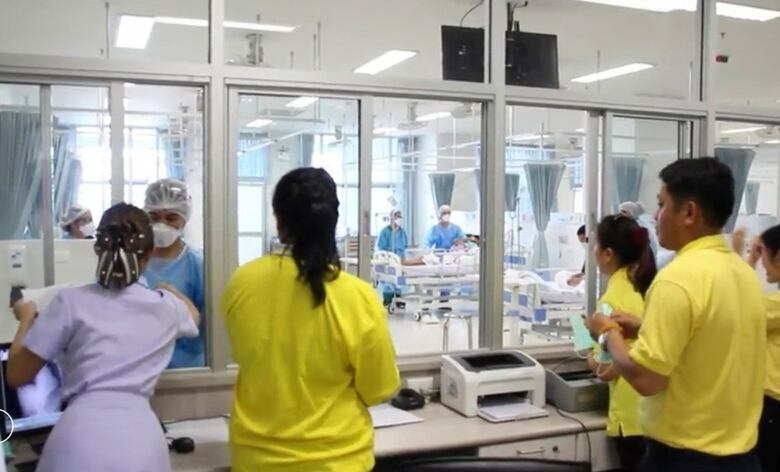 "Don't need to worry about their physical health and even more so for their mental health," said Chaiwetch Thanapaisal, director of Chiang Rai Prachanukroh Hospital. "Everyone is strong in mind and heart," he said at a news conference of officials involved in the rescue. Dr. Phil Ritchie, a psychologist at the Children's Hospital of Eastern Ontario in Ottawa, has worked extensively with children who have been through traumatic situations. He said it's important not to make assumptions about how the boys will fare mentally after their ordeal. "There is something called post-traumatic growth that sometimes we get as well, where actually people — kids and adults — will integrate a traumatic experience in a way that really allows them to move forward and make sense, make meaning out of what they've been through." But it's also important not to assume the boys and their coach are "fine," Ritchie said, and to ensure that supports are in place if they need them. Just as they were able to survive in the cave as a team, it's important that the boys are able to "heal as a group," he said, noting the fact they are all being kept together in hospital. The four boys and 25-year-old soccer coach who were brought out Tuesday on the final day of the three-day rescue effort have recovered more quickly than the boys rescued on Sunday and Monday, said Chaiwetch, the Thai health official. Even so, all need to be monitored in the hospital for a week and then rest at home for another 30 days, he said. Three have slight lung infections. Another video released on Facebook by the Thai Navy SEALs, who were central to the rescue, showed one of the boys being carried through part of the muddy cave on a stretcher covered by an emergency thermal blanket. The SEALs commander, Rear Adm. Apakorn Youkongkae, said the soccer coach, Ekkapol Chantawong, determined the order the boys should be rescued in. "The coach was the one to choose," he said. The group had entered the sprawling Tham Luang cave to go exploring after soccer practice on June 23, but monsoon rains soon filled the tight passageways, blocking their escape. They were found by a pair of British divers nearly 10 days later, huddled on a small, dry shelf just above the water, smiling with relief but visibly skinny. 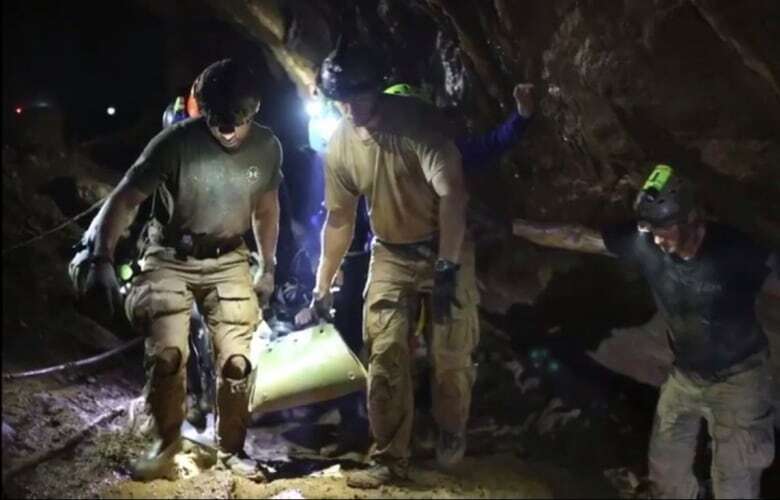 The complex mission for the rescuers from Thailand, the U.S., Britain, Australia, Canada and other countries to guide the boys and coach through the cave's flooded passageways riveted people worldwide. Highlighting the dangers, a former Thai navy SEAL volunteering to work on the rescue died Friday while replenishing oxygen canisters placed along the escape route. Chiang Rai province acting Gov. Narongsak Osatanakorn, who oversaw the rescue operation, said the boys should not be blamed for their near tragedy. He lauded the co-operation between Thai and international rescuers. "The situation went beyond just being a rescue mission and became a symbol of unity among mankind," he said. "Everyone worked together without discrimination of race or religion as the ultimate goal was to save the youth football team." Officials plan an interactive museum at the Tham Luang cave based on the historic rescue mission that will feature items such as clothing that key rescuers wore during the operation, Narongsak said. Each of the boys, with no diving experience, was guided out by divers though rocky, muddy and water-filled passages that in places were just a crawl space. The method was extremely risky, but dwindling oxygen levels in the cave and fears of more monsoon rains to come made a decision urgent. Relatively mild weather and a massive effort to pump out water created a window of opportunity. And the confidence of the diving team, and expertise specific to the cave, grew after its first successful mission Sunday. Thongchai Lertwilairatanapong, a public health inspector, said the boys lost an average of two kilograms while they were trapped. Before their discovery, they survived by drinking water dripping into their cramped refuge. "To not receive food, we can still survive for many months, but what's necessary is water, which the cave has, and around this time there's a lot in the cave, and they chose clean water to drink," he said.